As the weather warms and the calendar pushes along, WHSAD seniors get closer to the culmination of their years of high school study. Such closure brings them closer to life beyond WHSAD, and while the “real world” and its trials and tribulations beckon, many students have already taken some significant steps into such reality. Through internships, after-school programs, and partner projects, WHSAD students, in particular the seniors, have had ample opportunities to get tastes of punching the clock and developing networks that they can call upon in their future career searches. One such example of real-world experience is this year’s Bushwick Generator project. The following includes an overview of the project and student narratives regarding its relation to their classroom activities and their hopes for the project’s outcomes. 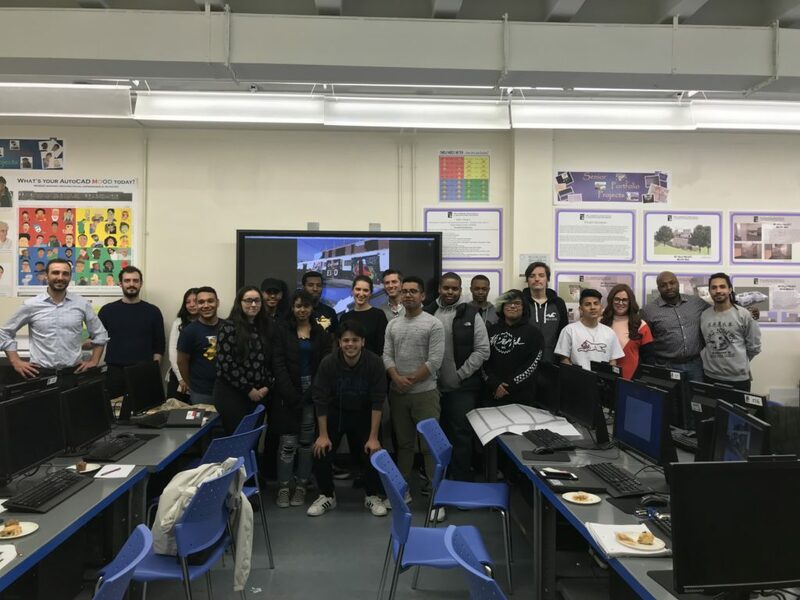 Thank you to those involved in supporting this work, including the architectural firm Hollwich Kushner; Ms. Toby Moskovits, President and Founder of Heritage Equity Partners; and WHSAD architecture teachers Mr. Alain Codio and Mr. Abraham Rodriguez. A new concept for commercial development:The Generator will be a community for working, learning, building networks and growing businesses. Community programming will encourage interaction between the neighborhood residents and building tenants. • Seminars and classes – aimed at local youth and adults as well as tenants. Project Bulk Regulations – assume M1-5 zoning requirements. To be further explained. The Bushwick Generator meeting was really interesting. There were architects that explained to us about zoning in an area and showed us maps and floor plans about the site that we will be working on. They also showed us some projects that they have done. For instance, “Wendy” is one of the biggest projects that they worked on. The Wendy structure is in a spacious area where people enjoy being outdoors and it’s a structure that people like to visit. The structure spits water to people so it’s like a sprinkler and it is made of a material that takes in carbon dioxide and air pollution and then puts out clean fresh air. “Pennovation” is another project that they worked on. This project was finished two years ago and is located in Pennsylvania. This building brings people together to interact for social activity,so this site is great for events and programs. I’m glad that I was able to attend this meeting with the architects because they explained how they design buildings, the importance of neighborhoods that are surrounded by the sites, the importance of zoning, and the specific things that we should consider when designing a building. They will also work with every group to help design the building structure for their company firm. I’m really looking forward to working with them and showing them my group’s ideas for the building. I feel like we will be able to do a fantastic job designing because we have professional architects that will be helping us with our designs. To start this off, I’d like to explain a little bit about what the seniors are working on in Codio’s class this year. Earlier this semester we were given an assignment in which we had to design a firm. Well, let’s backtrack a little bit more, before that our senior class had to come up with company names and what type of architecture field our company would be dedicated to. Some chose things like landscaping (my group), others interior design, but all of them varied. Afterwards, like I had stated before, we were told to design a firm (which we are still working on) but aside from that we’re also working on projects pertaining to our firm. One these projects is the Bushwick Generator Project. This project takes places (as the name suggests) in Bushwick. It’s a real life project that some students are working on along side the Hollwich Kushner firm. Representatives from this very firm came on Tuesday to give us more information about their work and the project we’ll be working on. They’ve designed various things like “Wendy”, a structure made to help clean the air and “25 Kent”, a building meant for office spaces. The Bushwick Generator Project will give us a chance to design and help us further understand zoning and how designing works in real life. The representatives were very understanding and thorough when explaining about the project. One thing that stood out to me most was how detailed their designs were and how much they take into consideration when designing or renovating a structure. I’m very excited to work on this project and hope to accomplish something significant in the future.